Reading aloud to children is one of the most beneficial activities parents can do with their children. Regardless of age, children benefit from hearing and using vocabulary that comes from books. 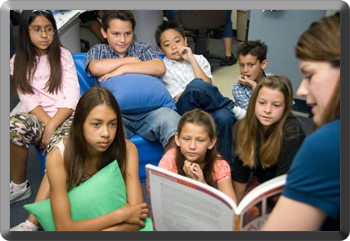 Reading aloud allows parents to model using sophisticated language and fluent reading. Text features and problem-solving skills commonly used in reading can also be demonstrated for children during a read aloud. This session will provide parents with ideas about how to most effectively use books to read aloud at home. 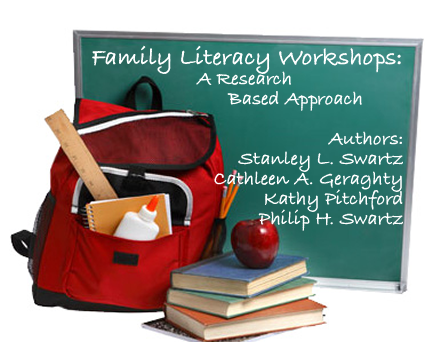 This workshop activity is designed to help parents and teachers explore and understand the reading process by mimicking the beginning stages of reading and focusing on the strategies used to decode and understand text. This activity addresses Writing Strategies, Writing Application, and Written and Oral English Language Conventions by creating a read aloud that the family can read and enjoy together. This activity addresses Reading Comprehension, and Listening and Speaking Strategies by reading and responding to a story through the creation of illustrations. This activity addresses Word Analysis, Fluency and Systematic Vocabulary Development, and Reading Comprehension and Listening and Speaking by practicing storytelling. This activity addresses Word Analysis, Fluency and Systematic Vocabulary Development, Reading Comprehension, and Literary Response and Analysis as children analyze print media and the messages that newspaper and magazine articles are communicating.